For the users and my own sake I finally added a change log page. You can find it here. This allows you to track what I have recently might have changed and makes it easier for you to find out about new features. From Feederators web interface you can jump the the change log page by clicking on the version number on the top right. The item list displays the set of the posts belonging to the currently selected feed. From the Special Feed list it sometimes was hard to figure out to which feed a post belongs to. By clicking on the feed icon or name you can now jump directly to the feed. For me this is by far the most exciting change for a long time: instead of only displaying the truncated text of a post you can now read the full article for many feeds. Please note: to extract an article from a website is some kind of guessing what the most significant part might be. This goes well for many cases but not for all. Please let me know if your feed doesn’t work. For a long time I thought that I would have to write that extraction code myself. I asked Mr. Google many times but I just couldn’t find an appropriate library. But sometimes you need some time to pass by and to get a different spin of an idea: I started looking for web services instead of libraries and soon these searches turned out to be more successful. For instance the guys over at http://fivefilters.org/ offer such a service. They have a free API with limitations, a premium service and you can buy the source code for your own hosting. Old releases can be found here for free. 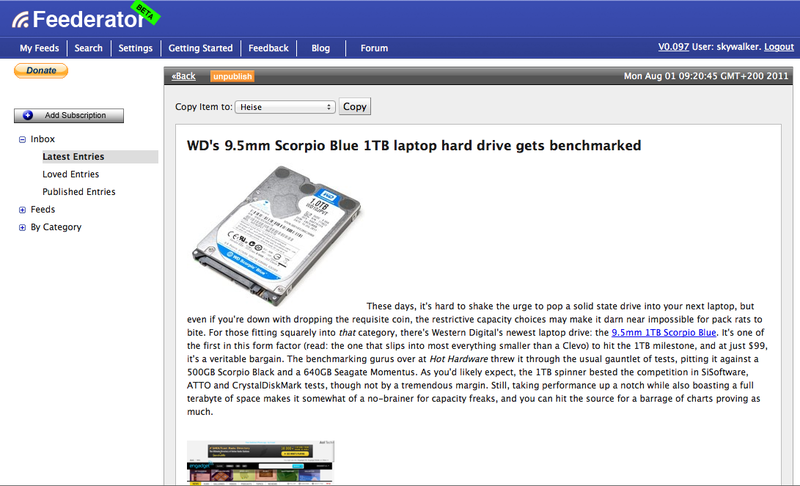 Having much more text per article due to the full text feature made it necessary to revamp the cluttered detail view. I think now the interface is much slicker than before. What do you think?